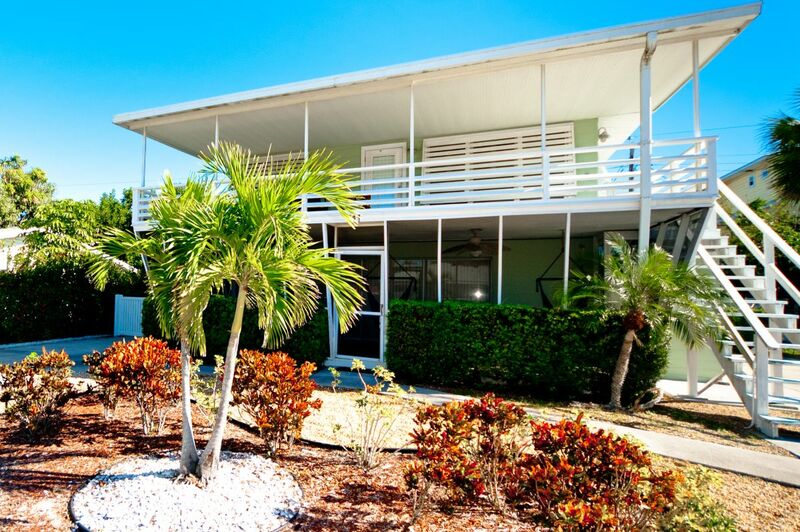 Beach Dream B is the upstairs unit of a classic Florida duplex in its original charm. 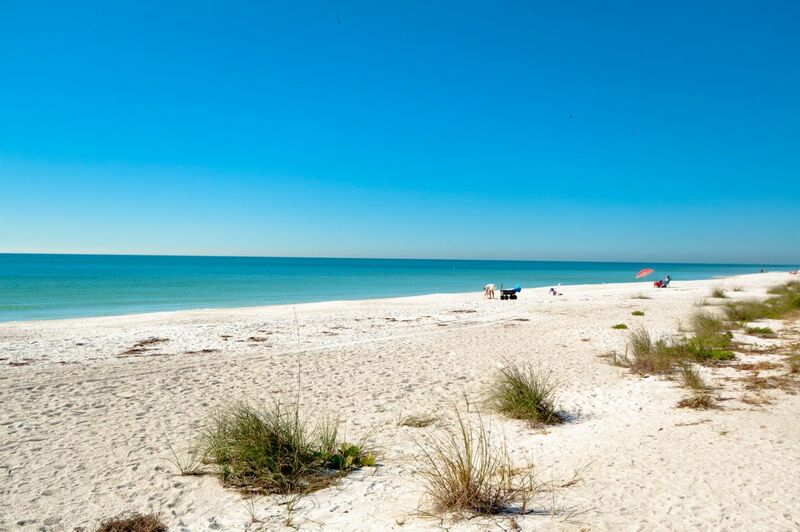 The unit is only a few houses away from the world class beaches of Anna Maria Island. 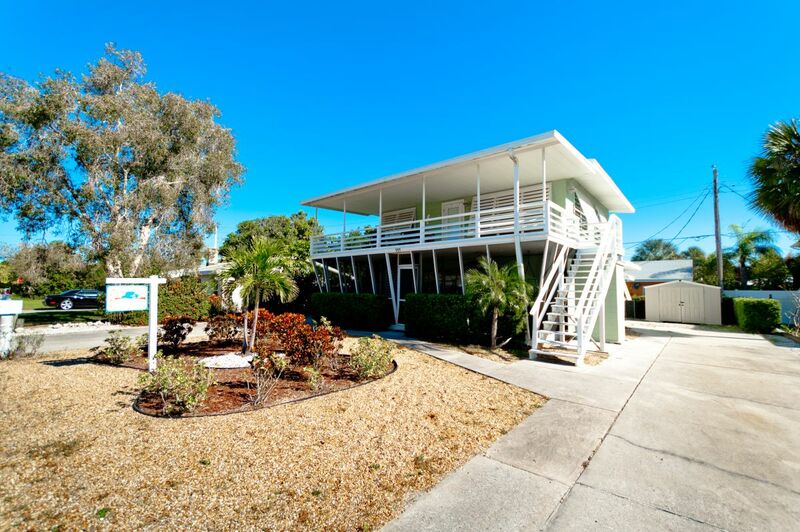 Ideal for two travelers who want to enjoy the quietness of the north end of Anna Maria Island and the proximity to the sandy beaches of the Gulf of Mexico. The bathroom has just been renovated, and the living room, bedroom with a king size bed and the porch are spacious and comfortable. Rent this unit together with the downstairs unit, Beach Dream A, for a larger party. Space for an RV or boat trailer. Please contact me with information regarding Beach Dream B (upstairs). 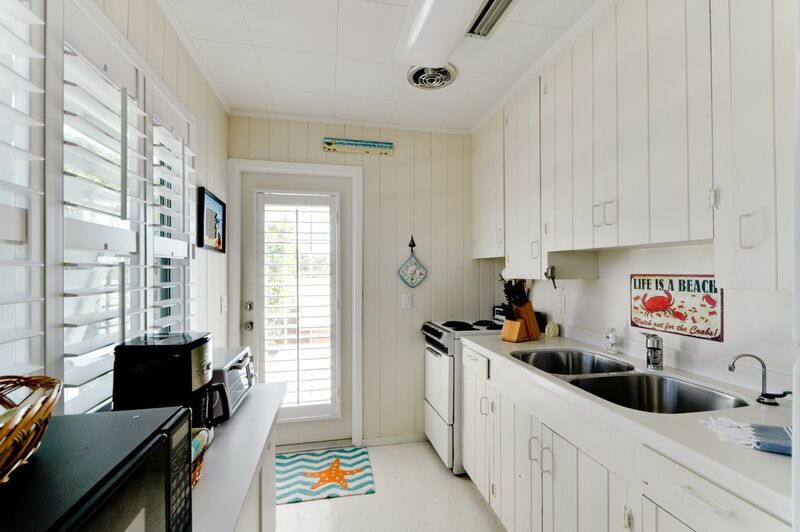 This unit hit all of our must haves: walk to the beach easily, very, very clean, large deck area for eating meals outside, easy to book and check in. The carpet has stains and the bathroom needs some caulk, but for the money, it was great for us. So it was fine. We enjoyed sitting on porch watching the ocean. Weather was windy and chilly but we enjoyed getting away! Hope to come back to the area again! Location was great and the local food was excellent. The weather was terrible but we made the best of it. Would recommend to any couples. Would like to come back when it’s warm. Suggest you bring your own toilet paper as we ran out after 2 days. No salt, pepper or sugar. Close to the beach! We stayed 10 days in that beautiful condo, making us like feeling at home. This well equipped, clean and cosy home is perfect for 2 people. The location is awesome and the very nice beach is just 2 minutes to walk. We stayed at Beach Dream "B" during August 25-31, 2018. We had an excellent experience. The first thing that we noticed is that the property is very well maintained. The inside of the unit was VERY clean and in excellent condition. Even the bathroom was very clean and bright. The place definitely has the BEACH feel. The paint colors were great. Almost forgot....the King-Size bed was awesome. I also have to say that I rarely sleep well on the pillows at ANY place where we stay. These were perfect. Not too flat, not too poofy. Slept great. The kitchen had everything you would need to cook. Kitchen was very clean and even the microwave was spotless. The front porch was awesome. We had plenty of room and didn't feel "Claustro" like we do in a hotel room. The walk to the beach took all of 1-1/2 minutes. The Manager of the property was GREAT. Any directions that they needed were right there. Everything from Restaurant ideas to How To use the remote on the really nice Big flat screen TV. The also had Cable with a lot of premium channels, as well as a DVD and even a VCR player! Washer and dryer were downstairs and easy to get to. The inside plantation shutters were really nice. My wife and I commented on the fact that someone spent some money on those! We have never rented a Condo before but this was a great experience, especially for our first time. Florida Dreams does an excellent job and we were totally satisfied. Unit was in a great location but needs some cosmetic work: carpet is stained, bathroom needs to be cleaned better-mold around tub, gutter coming off roof, year in downstairs screen and outside needs to be painted. Great experience. FL Dreams Realty really has it all together. This was so very easy booking and they even had the light on for me when I arrived which was a good thing since I didn't get in until 1AM due to flight delays. Great location on a wonderful beach. This was my pick for our purposes: near beach (half a block), second floor porch for view and feel of the air, living area is spacious and feels like a home (good art on walls). We just liked everything. Please let me know the renovation schedule. We would like to rent next year. Location was 400 ft from the beach, close enough to reasturants to walk. Size was fine for 2 people, attractive and overall cleanliness was good. Tub/shower left something to be desired. Could have been in better shape and cleaner. But I would go back. We enjoyed our stay at Beach Dreams B and would love to see it stay a 1 bedroom rental, the bathroom could use a lift but it's hard to find a nice 1 bedroom place and not everyone has a need for a bigger place. My wife and I spent our 25th wedding anniversary here and we were more than pleased. It was so perfect for our trip and all that we needed. It was clean, nothing went wrong or was broke. It did not disappoint. The location is awesome as well. Everything was really nice. Just needed a couple minor repairs other then that it was beautiful and you can see the water from the house and it's a short walk to the water. Also at the end if the street to the right they have a trollie pick up if you don't want to drive. We loved our stay in at the Dream Beach B apartment. The location was just a short walk to the beach. We liked that the beach was clean and not crowded. The apartment was extremely clean and had everything we needed for our stay. Management made it easy to check in and out. The perfect beach get away! As we had a great experience at this property last year, we decided to return for another vacation. We had a great stay - again! 3 doors from the best spot along the beach on a quiet street. We're hoping for a 3rd stay in the near future! My wife and I thoroughly enjoyed our stay and would gladly stay here again. 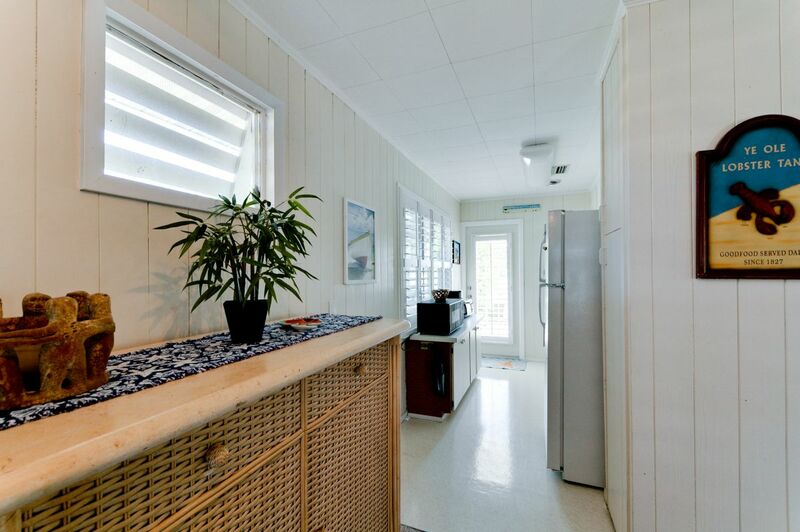 Well equipped kitchen, comfortable rooms, and a quiet neighborhood close to the beach. We arrived at sunset on our first day. There is a beautidul view of the skyline from the porch. Bed is kingsize and comfortable. New bathroom, just as clean as a pin. The kitchen is small but quite adequate for 2 people. We spend our time walking on the beach, swimming, and painting and knitting. It was great. I would rent this place again in a minute. We had beautiful weather, lots of walking, beach time and bicycling. The property was comfortable, everything that we needed was provided and the bed was very comfortable. Clean and well kept and the location was perfect. We enjoyed the small shops at eating at the Swordfish Grill and the Freckled Fin. We had a wonderful time! the house was perfect for the 2 of us. 5 houses from the beach. The island was great! Hoping to return next year! Wow, what a lovely place to spend some vacation time. Extremely comfortable, very well equipped & perfectly located (nice quiet neighbourhood). It would be impossible to find any downside. Particularly enjoyed the spacious deck. I do hope it will still be available in 2017. Florida Dreams Realty of AMI inc. were very helpful, the rental was absolutely spotless on arrival & they made sure we had everything we needed. Didn't want to leave when our vacation came to an end. 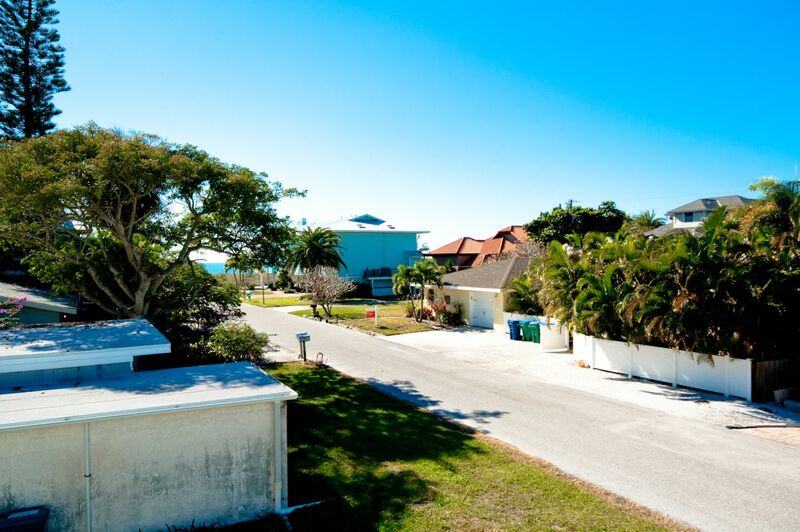 For my Anna Maria Island vacation, I stayed in Holmes Beach at Beach Dream B on 75th Street, just a few houses down from the beach. The place was recently renovated, I think, and very clean and commodious for a single or a couple. The one problem I had was that the door code I received via eMail only worked once. I had to call the Agency to get a new code. really enjoyed the time we spent there, quiet area and nice breeze from the gulf. Need a new beach umbrella. the best words to describe this total experience is...pristine (inside &outside), effortless, and truthful from description and pictures. We had no issues with anything, the real estate company was impeccable. I have never had such a great experience. This beach cottage is better than advertised! It was not fancy but instead a perfect beach cottage with a great terrace with lovely warm breezes. The rental was very nice, quite, close to the beach. The only issue we had was that the sheets were to small for the bed. Everything you would need was there. We like the homey feel of the area. Only 3 steps from the beach on a quiet little street, this beach house was perfect. The decor was fresh and beautiful as shown in the photos. The well-stocked kitchen allowed us to have quiet meals when we didn't feel like going out. We will definitely recommend to friends and would love to stay again. We had a great time on Anna Maria Island! This rental was very close to a beautiful beach and in a quiet neighborhood. It was easy to take the island trolley to Anna Maria - and we also could walk a mile up the beach to get there as well. The rental was clean and very comfortable. Location was great, and island was wonderful. Six houses from the beach. Cute, clean, and fun! We loved our Beach House. Nice quiet neighborhood only a few houses off the beach.